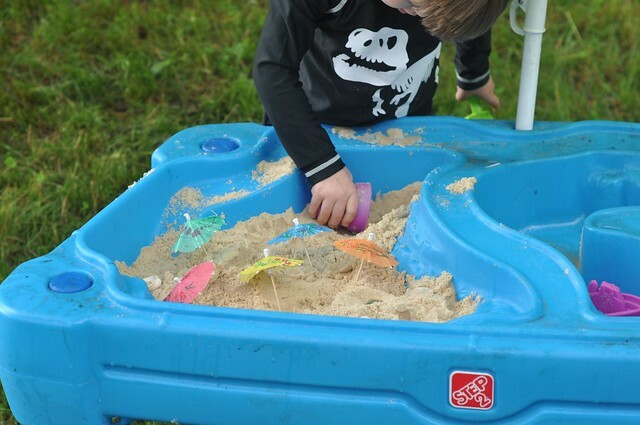 We are big fans of sensory play! 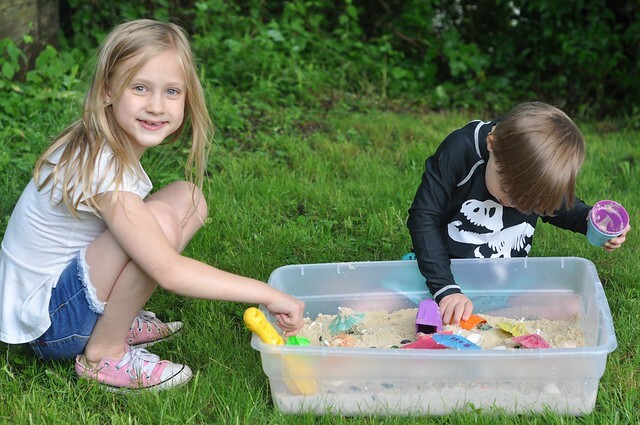 It's messy, it's fun, and the benefits are extensive. 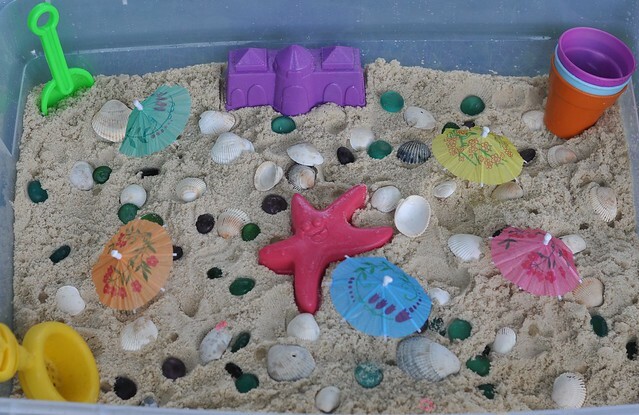 With Summer Break officially beginning this week, I put together a beach themed sensory bin to get my kids excited about having a summer full of fun! I've been creating sensory bins for many years for my children, but put more emphasis on it when Liam was born. 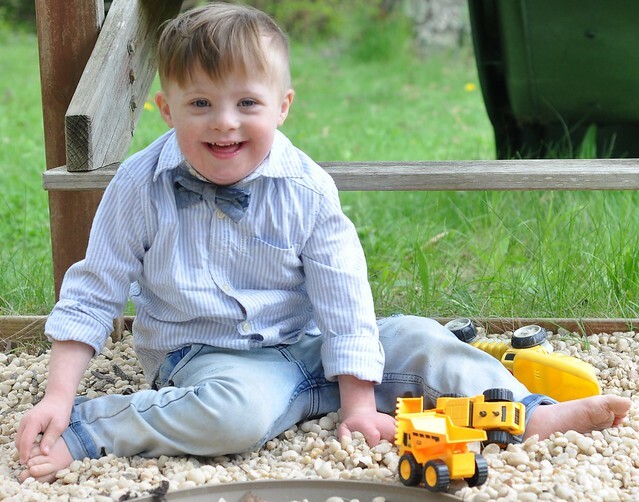 My research led me to believe that sensory issues are common for kids who have Down syndrome, and I was determined to do everything I could. 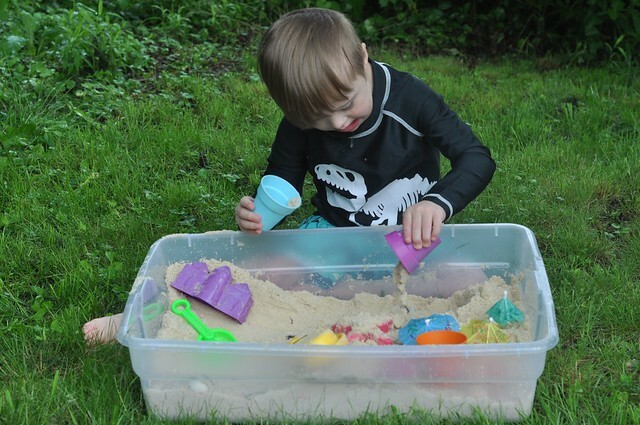 I introduced sensory play when he was a baby, and it became a regular - and fun - part of our therapy routine that the rest of my kids continue to benefit from! 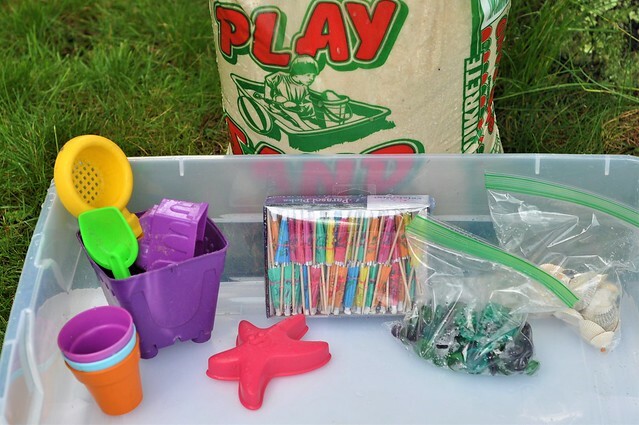 This fun, summery sensory bin is so simple to put together! It's inexpensive to create, and it can be used over and over again. It's also portable, which makes it a fun choice for a family reunion, playdate at the park, or a picnic! 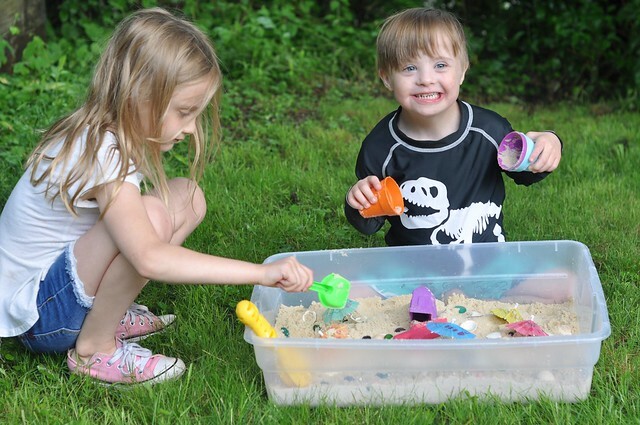 Pour about 10 lbs of play sand into a storage bin. We like to use under the bed plastic storage containers! Mix in shells and sea glass. 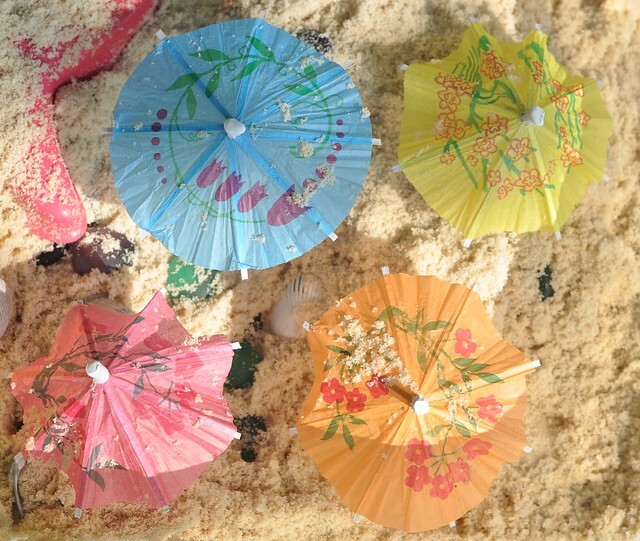 Assemble the mini umbrellas and poke them into the sand. 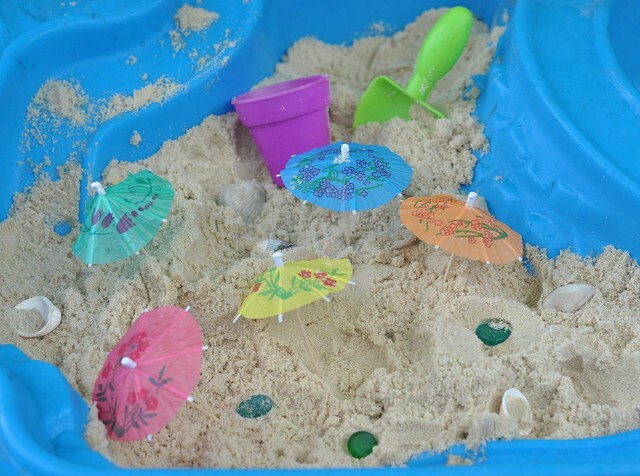 Toss in the sand toys! 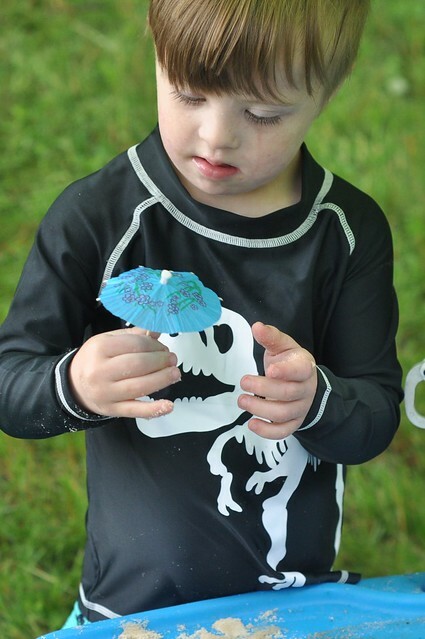 Helps build gross and fine motor skills. Stimulates the senses of touch and sight. 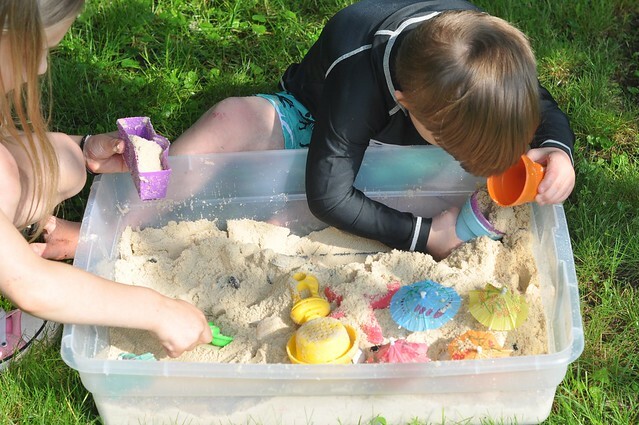 Sensory Play can have a calming effect on a child. Helps strengthen muscles in the hands. 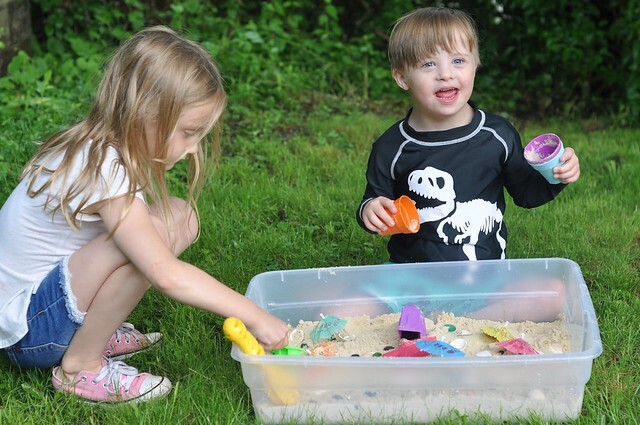 Builds social skills when kids play together. 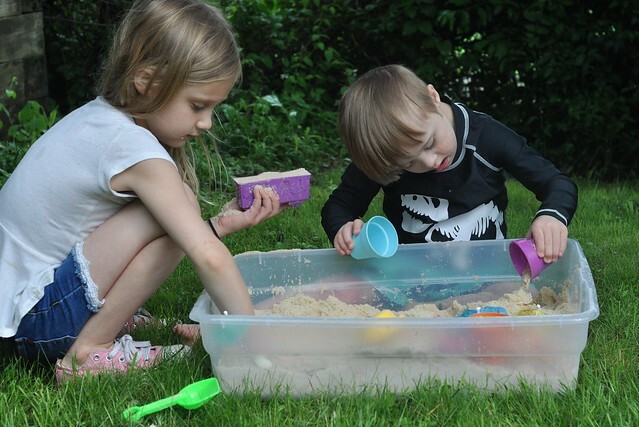 Inspires creativity and imaginative play. Introduces a variety of textures. 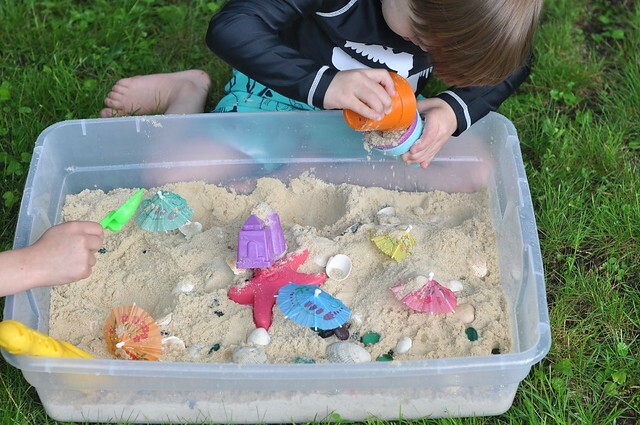 Scoop up all the shells and sea glass with the shovel, and place in the buckets. Bury the shells and sea glass, and dig to find them. 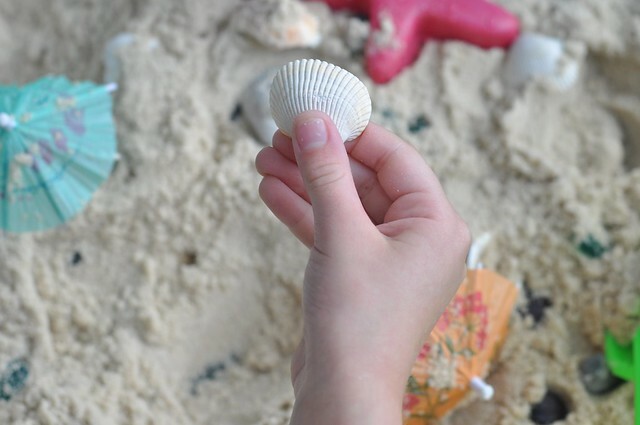 Sift the sand to locate the "treasures." Count the shells/sea glass as you collect them. Create a beach scene with the umbrellas, shells and sea glass. Sort the umbrellas by color. 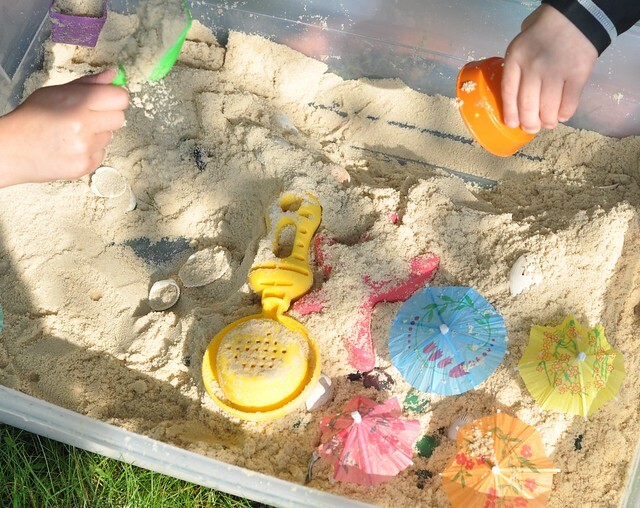 Shovel and sift the sand into the buckets and sand molds. 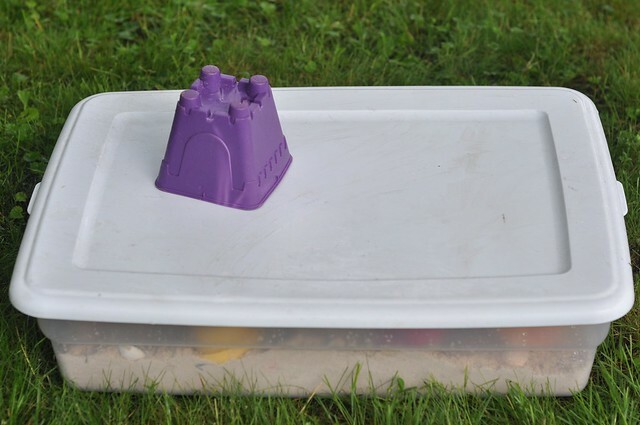 Create a mini castle with the sand molds, and decorate with shells and sea glass. Use descriptive words while playing to label the items. Thanks to the lid on the sensory bin, cleanup is a breeze! Just keep all items in the bin, secure the lid tightly, and store in a cool, dry place. 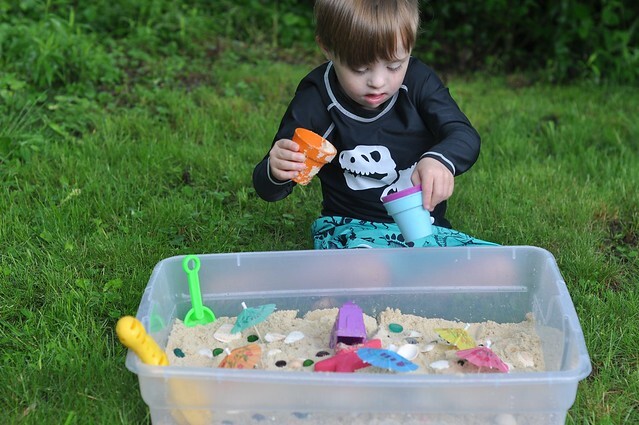 Using a sensory table as a sensory bin is a great alternative! It encourages vertical play, while the rest of the benefits remain the same. 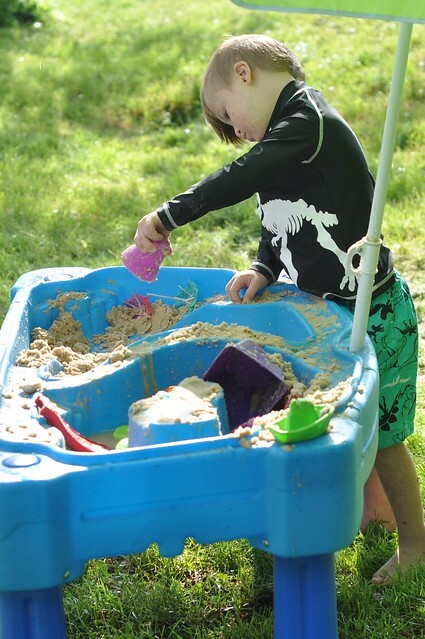 Plus, you can take the mess outdoors if the indoor sensory play mess just isn't your thing. 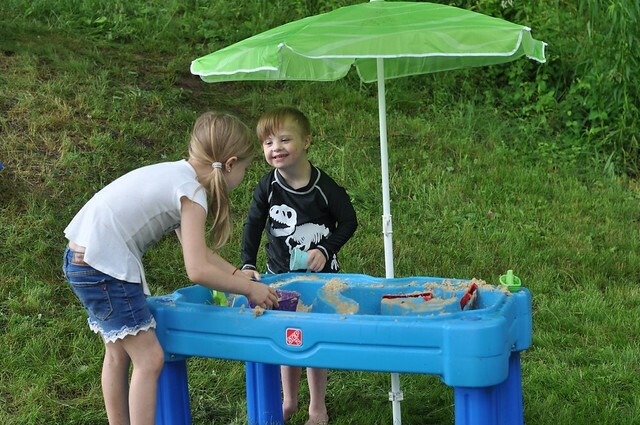 We love the Step 2 Cascading Cove Sand and Water Table! 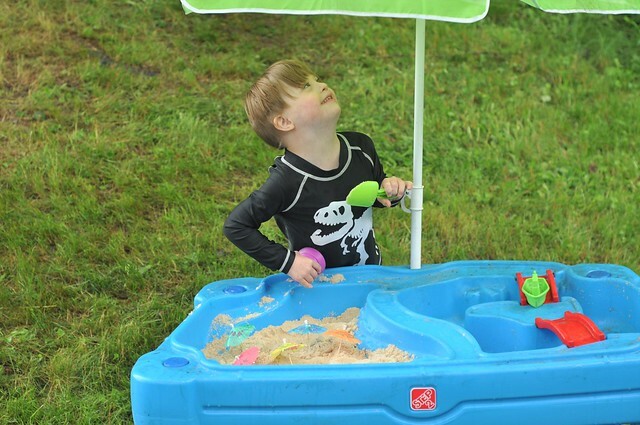 My kids love the removable cover with the built in road on it, and the umbrella protects them from the sun during outdoor play. Although I'm not afraid of messy indoor play, using the table is another fun sensory option! DISCLAIMER: It goes without saying, but all sensory play activities should be fully supervised! Only 1 more day of school left after today! My kids are so excited about the Summer ahead! I think it's bittersweet because time is passing by too quickly, but I'm looking forward to spending the summer with all four of my babies! 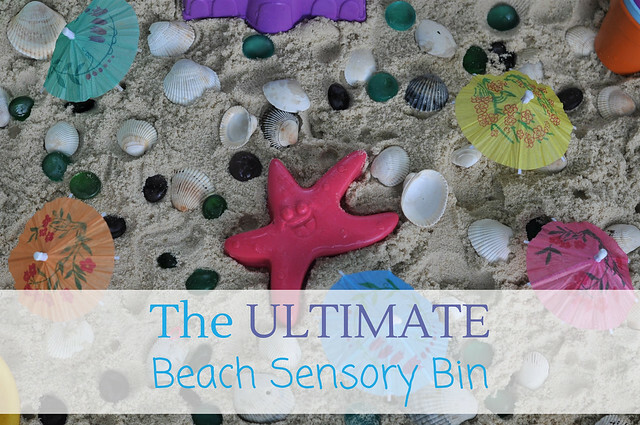 You always make the best sensory bins!!! I love this one! I love this and it just so happens that I bought some shells from the dollar store for Eliza's birthday and already have some on hand!! WooHoo!! Yay for one more day of school! 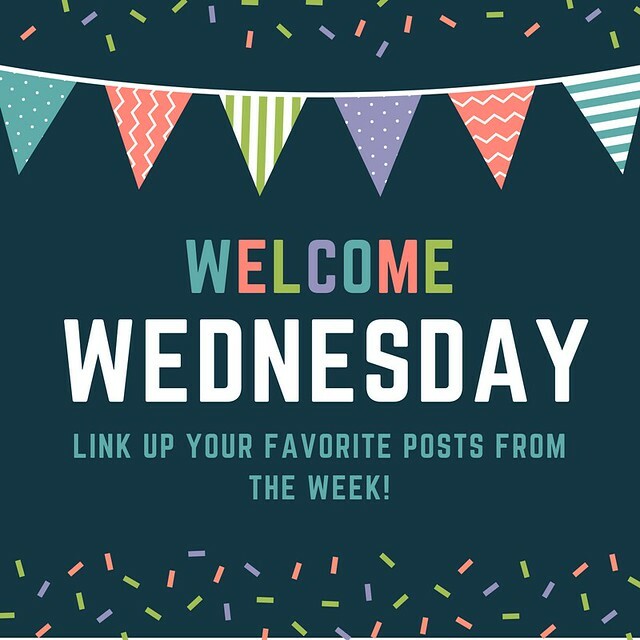 Ooo, you should make one for your kiddos! This looks like a lot of fun. 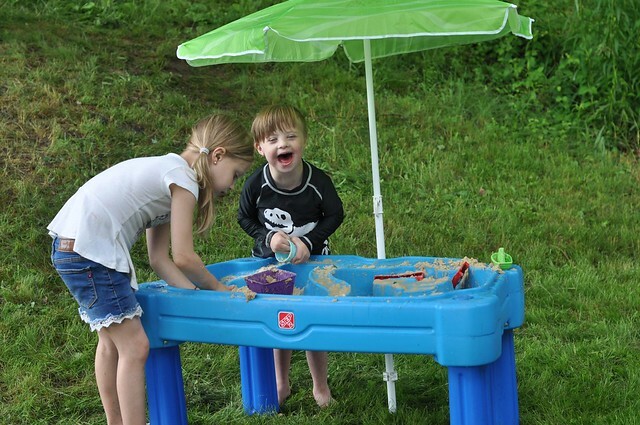 We have a water table that broke, maybe I should change it to a sand table! I love seeing these. I think this would be something my youngest niece would REALLY love, but I could see her siblings having fun with it too. Thanks for sharing. My 11 year old likes to sneak over and join in on the fun, too!